Felicantonio Marano first appears in the Painesville, Ohio, area in the mid 1920’s. He moved from Willoughby, Ohio. 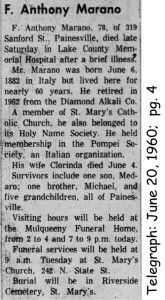 In America, Felicantonio Marano was known as F. Anthony Marano. Felicantonio Marano, son of Salvatore Marano, was born on June 6, 1882, at Sant’Angelo in Grotte, Italy. He married Clorinda Filomena Bertone, daughter of Francesco Bertone. Felicantonio died on June 18, 1960, at Lake County Memorial Hospital, Painesville, Lake County, Ohio, at age 78. His body was interred at Riverside Cemetery at Painesville, Lake County, Ohio. Felicantonio Marano, age 21, first immigrated to the United States on October 14, 1903, travelling to New York City. Anthony Marano is shown as re-entering the United States on March 25, 1908. He was traveling to Ashtabula, Ashtabula County, Ohio, joining his cousin, Nicola Bertone. He was previously in the United States from 1903 to 1906. 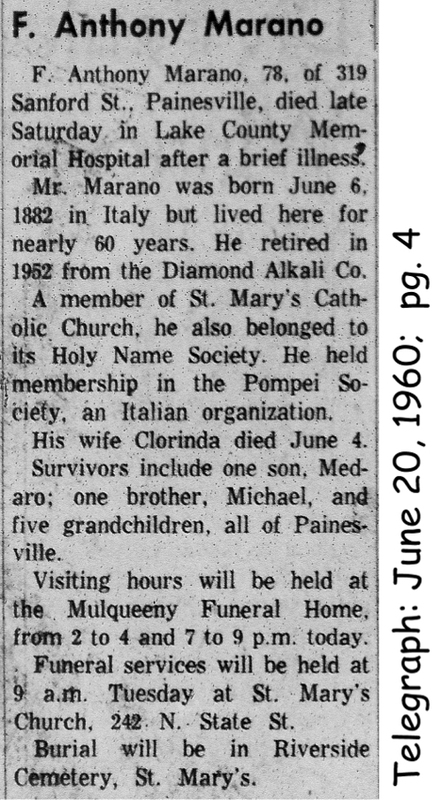 In 1911, Felicantonio’s brother, Michele Marano, joined him in Willoughby, Ohio. Felicantonio Marano became a citizen of the United States on October 1, 1928. He resided at 616 North State Street, Painesville, Lake County, Ohio, when he was naturalized. His wife and son immigrated to the United States in the late 1930’s. At the time of death, Felicantonio resided at 319 Sanford Street, Painesville, Lake County, Ohio. Felicantonio was employed by the Diamond Alkali Company retiring in 1952.